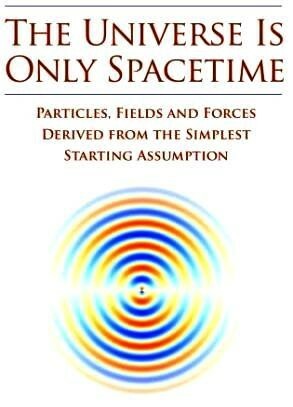 The OST model is the work of John Macken, who is a scientific inventor with expertise in lasers and optics, who published an extensive 373-page book entitled ‘The Universe is Only Spacetime’, see link for details of his website. However, the following quote is taken from the introduction of the OST book such that it might give an initial indication of the scope of the ideas. In most introductory classes on quantum mechanics, the physics professor starts out by explaining to the students that they are going to learn about certain properties of subatomic particles that are simply not conceptually understandable. For example, subatomic particles can discontinuously jump from one point to another without passing through the surrounding space. Fundamental particles exhibit angular momentum even though they are virtually point particles. An isolated molecule can only rotate at specific frequencies. Two entangled photons can communicate faster than the speed of light over large distances – etc. These and many other quantum mechanical effects are not understandable when analyzed using current conceptual models of particles and forces. To be fair, a strict application of the principles of quantum mechanics does not strive to give a physically understandable explanation of these phenomena. Instead, the objective of quantum mechanics is to describe rules of each quantum mechanical operation and mathematical equations which describe these operations. For example, an electron is described as a point particle because this mathematical simplification is adequate to obtain useful equations. As Paul Dirac said, the aim is 'not so much to get a model of an electron as to get a simple scheme of equations which can be used to calculate all the results that can be obtained from experiment'. Today, physicists have learned to suppress their innate desire for conceptual understanding. The explanation given for our inability to conceptually understand quantum mechanical phenomena ultimately implies that the human brain evolved to understand the macroscopic world. Therefore, we simply should not expect to conceptually understand the properties of subatomic particles or photons. These concepts are just too far removed from our hunter gatherer roots. Over time we reluctantly learn to accept abstract quantum mechanical concepts and regard the desire for conceptual understanding as a remnant of classical physics. However, the importance of a model that gives conceptual understanding should not be minimized. If there really is an underlying simplicity to all of physics, then understanding this most basic model not only simplifies the teaching of physics, but also makes it easier to extend this model and make testable predictions which advance science. Such a model would be a powerful new tool that would greatly accelerate the rate of new discoveries. This section of the website-3 is being reserved for a review of the OST model, which differs from the WSM model described by Wolff and LaFreniere as it assumes that spacetime is a form of superfluid that requires the quantization of angular momentum and where the wave structure exists below the Planck scale. The work of John Macken has not yet been reviewed. As such, the information on this page is simply a placeholder for future reference.